Used to assist with the relief of local, acute and long standing soft tissue pain in any region of the body. Blood flow or vascular supply is necessary for health and well being as it delivers nutrients to all cells in the body and carries away waste. 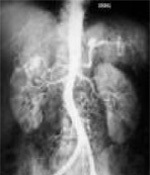 In many old or long standing injuries the vascular supply may become compromised leading to delayed or non healing. The Vascular card is used to encourage the formation of new blood vessels and to assist in the re-establishment of the body’s natural repair processes. Delayed or non healing injuries. Long lasting inflammation that remains after 14 days following injury. Weakness or pain in muscle groups without trauma. Pains not associated with identifiable joint pathologies or illness.